PCAI supports Emilia Bouritis’ work and performance for Aisxylia Festival 2015. Eleusina, a place characterized by prominent ancient history, at the same time marks the country’s industrial evolution since the turn of the 20th century. 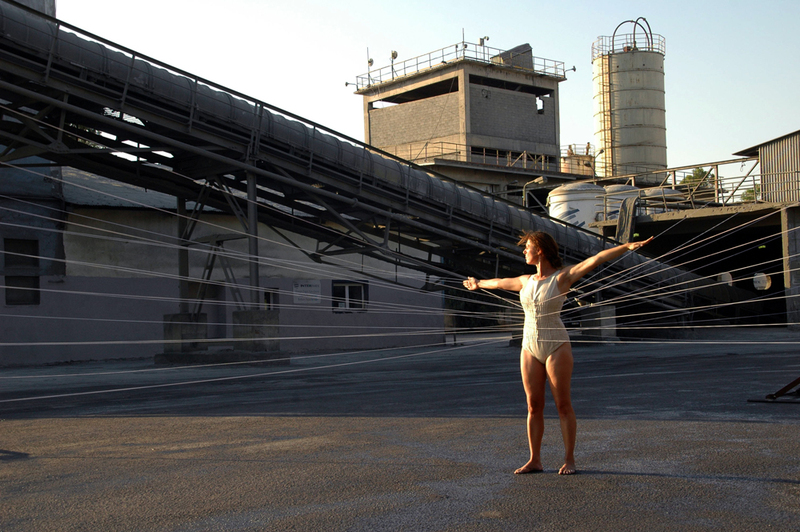 The artwork “Eleusis / Space Time Energy” explores the relationship between the human body and the industrial landscape of Eleusina. The body is placed as a vibrating field in the industrial areas, (TITAN Cement Company S.A Eleusina Plant, Old Quarries, Old Shipyard, Hellenic Petroleum S.A. – Elefsina industrial installations – former Petrola). As a measuremt, the human body uses its own memory and experience to register the architecture, the dynamic and the history of the industrial area.The body moves through the sites creating a new environment where man meets the industrial space, coexists with and recreates a new field of reality. The artwork uses body movement, site specific art, performance, installation, moving image and photography as means of expression.